Saint Leander was born of an illustrious family at Carthagena in Spain. He was the eldest of five brothers, several of whom are numbered among the Saints. He entered into a monastery of Seville very young, where he lived many years and attained to an eminent degree of virtue and sacred learning. These qualities occasioned his being promoted to the see of Seville; but his change of condition made little or no alteration in his way of life, though it brought on him a great increase of solicitude. Spain at that time was held in possession by the Visigoths. These Goths, being infected with Arianism, established that heresy wherever they came, in such wise that at the time Saint Leander was made bishop, it had already reigned in Spain a hundred years. This was his great affliction. Nonetheless, by his prayers to God and by his most zealous and unwearied endeavors, he became the happy instrument of the conversion of that nation to the Catholic faith, as his story makes clear. The holy archbishop had converted, among others, his own nephew Hermenegild, who was the king's eldest son and heir apparent, and for this he was banished by King Leovigild, his own brother-in-law. The pious Catholic prince, now known as Saint Hermenegild, was put to death in prison by his unnatural father in the following year, for refusing to receive Communion from the hands of an Arian bishop. Afterwards, touched by grace and filled with remorse, the king recalled Saint Leander. When Leovigild fell sick and found himself past hopes of recovery, he sent for Saint Leander, and recommended to him his other son Recared. This son, by listening to Saint Leander, became a Catholic, and finally brought the whole nation of the Visigoths to the faith. The new king Recared also brought the Suevi back to Catholic unity; they were a people of Spain whom his Arian father Leovigild had perverted. 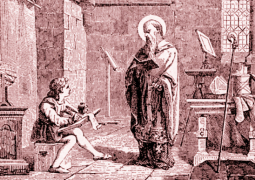 Saint Leander was no less zealous in the reformation of morals than in restoring the purity of faith, and planted the seeds of the zeal and fervor which produce martyrs and Saints. He received from Saint Gregory the Great a painting of the Mother of God by the hand of Saint Luke, Evangelist, since known as Our Lady of Guadelupe (of Spain). It is he who, as a refutation of Arianism, added to the liturgy of Spain the recitation during Mass of the Nicene Creed, which practice spread to Rome and then to the entire Church. This holy doctor of Spain died about the year 596, on the 27th of February.